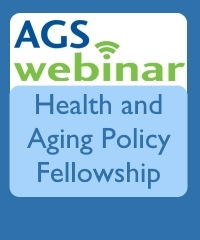 In February 2018, the American Geriatrics Society hosted a webinar highlighting the Health and Aging Policy Fellows Program. The webinar served as an informational session to learn more about the Health and Aging Policy Fellows Program, its mission, and the opportunities it offers to actively shape health policies at the national, state, and local level that will benefit older adults. The recorded webinar allows you to be able to hear first-hand from the leadership of the program as well as current and former fellows about this unique opportunity. The Fellowship is open to professionals in all disciplines and at all career stages.